We are interested in small RNAs called microRNAs (or miRNAs) that regulate the production of proteins. Our goal is to understand their contribution to certain aspects of metabolic disease and cancer. Almost all cells in the body carry the same genetic information in in the chemical form of DNA (referred below as « genes »). However, in any given cell type, only a very small fraction of all genes are « in use ». The particular selection genes that are used in different cell types largely defines how a cell looks like and behaves. This explains why for example a skin cell looks and behaves very different from a blood cell. Many steps are required in the process from the genetic information (stored in the form of DNA in the nucleus) to the production of proteins that serve as the cellular building blocks and machines. First, the genetic information in the nucleus is copied into a short-lived intermediate message, the so-called messenger RNA (mRNA). This mRNA is then exported from the nucleus to the cytoplasm, where it serves as a template for the production of proteins. Regulation of protein production can occur at many different levels. We are interested in this regulation at two levels. First, we are interested in how a group of proteins called transcription factors (including the tumor suppressor factor p53) regulates the production of mRNAs. Second, we are particularly interested in a group of regulatory RNA called microRNAs (or miRNAs) that destabilized mRNAs and reduce production of certain proteins. Chemically, these miRNAs are made of the same building blocks as mRNAs, but they are much shorter as indicated by the name « micro »RNA (often abbreviated as miRNA). The human genome contains about a thousand miRNAs. Curiously each single miRNA regulates not only the production of one, but in many cases hundreds of proteins. In turn, many proteins can be regulated by several miRNAs. Understanding the functions of particular miRNAs is therefore not trivial. In our work we try to understand how these regulatory processes work together in cancer and metabolism. Eventually this might help discover novel therapeutic approaches. miRNAs are small non-protein-coding RNAs that can bind to mRNA transcripts of protein coding genes. Upon binding to these mRNAs, they inhibit their translation into proteins. However, each miRNA does not only recognize one target transcript, but rather numerous – in some cases several hundreds – of target transcripts. In addition, for many miRNAs, multiple different genes exist, that encode highly similar or identical mature miRNAs. The potential for combinatorial complexity and functional redundancy is therefore enormous. The focus of our group is on the role of miRNAs in conserved signaling pathway at the crossroad of cancer and metabolism. Precursor transcripts of miRNAs (i.e. pri-miRNAs) are produced by RNA polymerase II in the nucleus. These transcripts contain hairpin structures that are cleaved out by a complex containing the endonuclease DROSHA. 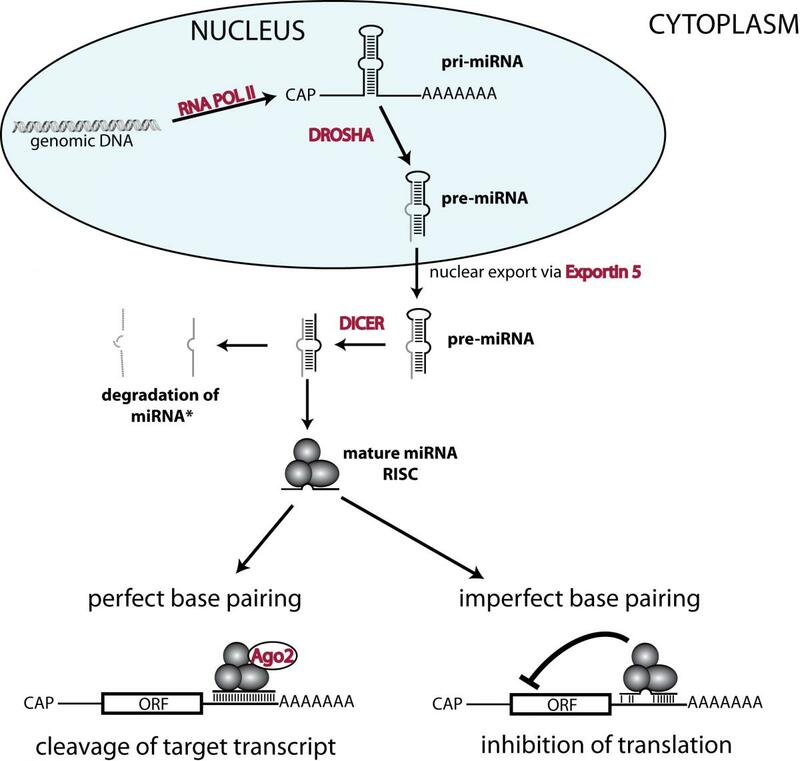 The resulting pre-miRNA is exported from the nucleus into the cytoplasm, where the endonuclease DICER cleaves off the loop and generates double stranded RNAs. One (or sometimes both) of these strands get incorporated in the RNA induced silencing complex (abbreviated as RISC). Depending on the degree of similarity, miRNA binding to the 3’ untranslated region (of target transcripts leads to either AGO2 dependent cleavage or translational inhibition. ORF= open reading frame; CAP = 5’ mRNA CAP. Fatty acids, cholesterol, and their lipid derivatives play essential roles in normal cellular function and serve as structural components, signaling molecules, and/or as storage forms of energy. In multicellular organisms, cellular lipid metabolism is regulated to match the needs both of individual cells and of the entire organism. 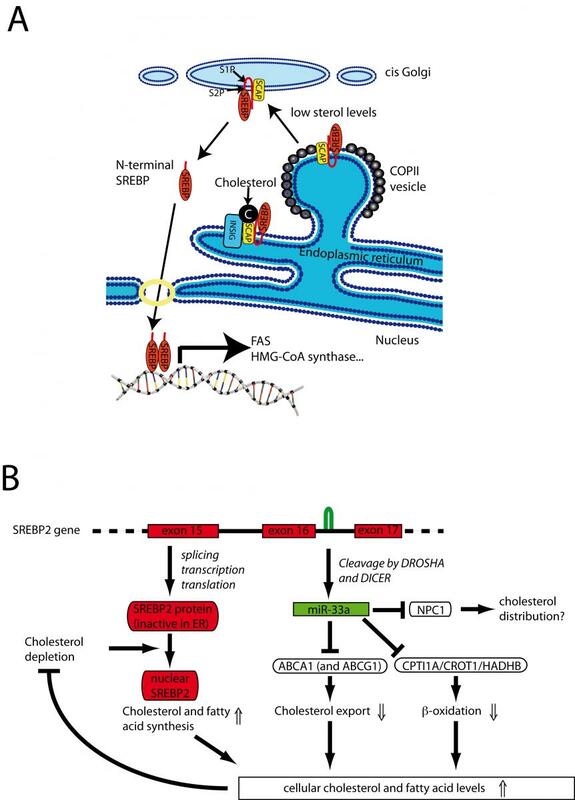 The sterol regulatory element-binding factor-2 (SREBF2) gene is a bifunctional locus encoding SREBP-2, a well-known transcriptional regulator of genes involved in cholesterol and fatty acid biosynthesis, and miR-33a. We and others have recently shown that miR-33a can reduce the expression of several proteins involved in the cellular export of cholesterol and β-oxidation of fatty acids, thus adding an unexpected layer of complexity and fine-tuning to regulation of lipid homeostasis. In fact, work of other groups has demonstrated that this mechanism might represent a therapeutic target in the treatment of hypercholesterolemia. We are continuing to investigate the physiological role of miR-33 family members in different experimental systems throughout evolution. After processing from an intron of SREBF2, miR-33a reduces cellular cholesterol export by inhibiting expression of ABCA1 (and in the mouse ABCG1). In addition, miR-33a reduces mitochondrial fatty acid b-oxidation via inhibition of HADHB, CROT, and CPT1A to increase intracellular lipid levels. Thus the SREBF2 locus uses two distinct mechanisms to maintain lipid homeostasis: regulated transcriptional activity of SREBP-2 and translational repression by miR-33a. The intestine is required for the digestion and absorption of essential nutrients and water. In this process, its surface epithelium is exposed to one of the most toxic milieus of the whole body. It has to resist aggressive digestive juices, large pH changes, anaerobic bacteria and numerous toxic compounds. To resist this, its surface epithelium is completely renewed in less than 2 weeks. 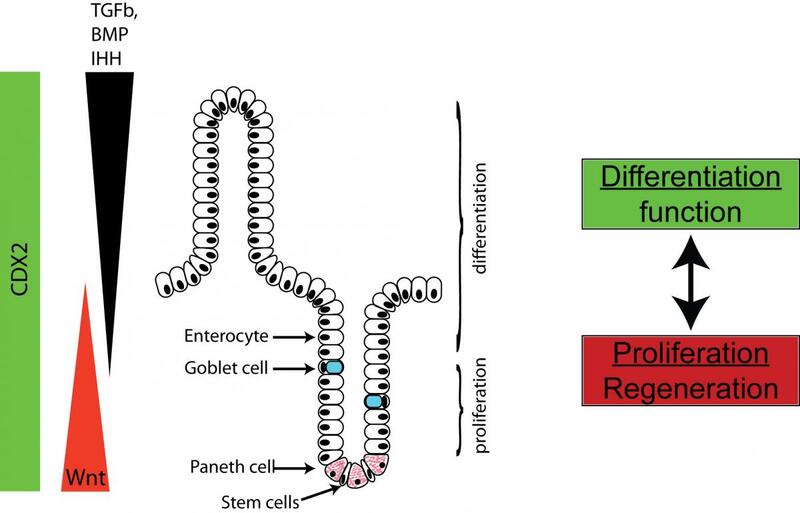 An intricate network of signaling pathways controls the proliferation and differentiation from intestinal stem cells to the mature cell types. We are studying the role of miRNAs in this differentiation process and how they contribute to intestinal differentiation as well as the development of colorectal cancer. Intestinal architecture is maintained by the interplay of many signaling pathways. The intestinal architecture is maintained by the interplay of signaling patways that ensure complete renewal of intestinal surface epithelia within 7 to 14 days. New cells are generated from a stem cell compartment at the base of the crypts and successively migrate up, where they are eventually shed in the lumen. We are focusing our interest on miRNAs that regulate this process. The p53 protein is a transcription factor that acts as the central hub of a tumor suppressor pathway. It is stabilized when cells are exposed to a large number of stresses such as oxidative stress, nutrient starvation, oncogene activation and DNA damage. This leads to the transcriptional activation of many target genes. Upon mild stress, these target genes induce cell cycle arrest, reduce oxidative stress and activate DNA damage repair pathways. This seems to help sub-lethally damaged cells to repair the incurred insults. Upon stronger stress, cell death and permanent cell cycle arrest (or senescence) remove damaged cells from the proliferative pool. In recent years, the effects of p53 on metabolism and cellular redox status have received increasing attention. One of the milestones was the identification of the gene TIGAR as direct target gene of p53. As indicated by its name Tp53 induced glycolysis and apoptotis regulator), this protein regulates glycolysis and modifies apoptosis. It has long been assumed that this effect is due to a direct effect of TIGAR on the glycolytic regulator fructose 2,6-bisphosphate. We have recently found that fructose 2,6-bisphosphate is a rather poor substrate for TIGAR (kcat/Km 0.3 mM-1 s-1) and that 2,3-bisphosphoglycerate is an about 400x better substrate (kcat/Km 135 mM-1 s-1). This has significant implications for our understanding of the metabolic changes downstream of p53 as well as for cancer cell metabolism in general. It also suggests that the role of 2,3-bisphosphoglycerate needs to be revisited. The local “success” of a cancer cell is measured by its ability to proliferate and survive better with the available nutrients than its neighbouring normal or cancerous cells. Like any other cell, a cancer cell needs to maintain cellular integrity and fulfill baseline housekeeping functions (reviewed in Vander Heiden et al 2011). Many thermodynamically unfavourable reactions are driven by concomitant hydrolysis of ATP. All cell types therefore need to synthesize ATP by breaking down nutrients in pathways such as glycolysis, citric acid cycle and most efficiently mitochondrial oxidative phosphorylation. In addition, proliferating cells in general and cancer cells in particular need to generate bio-mass. Synthesis of amino acids, nucleotides and lipids starts with precursors that are intermediary products in the same pathways that are used to synthesize cellular ATP. Several adjustments of the flux through these pathways are needed to reconcile cellular demand for biosynthetic building blocks and for ATP synthesis. 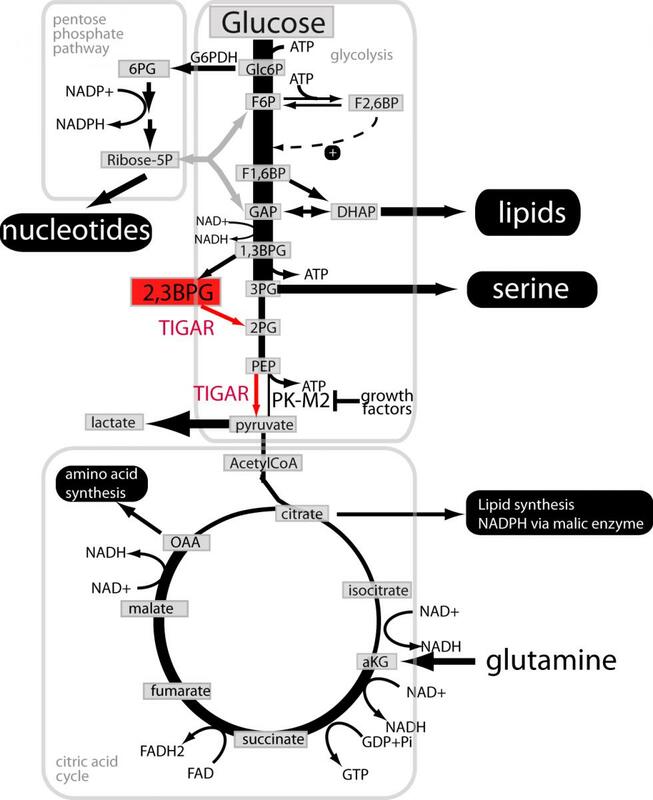 Our data suggest that TIGAR might contribute to the metabolic adaptations in cancer at the indicated steps. Phosphoglycolate has profound metabolic effects but most likely no role in a metabolic DNA response in cancer cell lines. Gerin I, Bury M, Baldin F, Graff J, Van Schaftingen E, Bommer GT. Failure to eliminate a phosphorylated glucose analog leads to neutropenia in patients with G6PT and G6PC3 deficiency. Veiga-da-Cunha M, Chevalier N, Stephenne X, Defour JP, Paczia N, Ferster A, Achouri Y, Dewulf JP, Linster CL, Bommer GT, Van Schaftingen E.
Proc Natl Acad Sci U S A. 2019;116(4):1241-1250. A conserved phosphatase destroys toxic glycolytic side products in mammals and yeast. Collard F, Baldin F, Gerin I, Bolsée J, Noël G, Graff J, Veiga-da-Cunha M, Stroobant V, Vertommen D, Houddane A, Rider MH, Linster CL, Van Schaftingen E, Bommer GT. Nat Chem Biol. 2016; 12(8):601-7. ISPD produces CDP-ribitol used by FKTN and FKRP to transfer ribitol phosphate onto α-dystroglycan. Gerin I, Ury B, Breloy I, Bouchet-Seraphin C, Bolsée J, Halbout M, Graff J, Vertommen D, Muccioli GG, Seta N, Cuisset JM, Dabaj I, Quijano-Roy S, Grahn A, Van Schaftingen E, Bommer GT. Identification of TP53-induced glycolysis and apoptosis regulator (TIGAR) as the phosphoglycolate-independent 2,3-bisphosphoglycerate phosphatase. Gerin I, Noël G, Bolsée J, Haumont O, Van Schaftingen E, Bommer GT. Mutant KRAS promotes hyperplasia and alters differentiation in the colon epithelium but does not expand the presumptive stem cell pool. Feng Y, Bommer GT, Zhao J, Green M, Sands E, Zhai Y, Brown K, Burberry A, Cho KR, Fearon ER. Regulation of lipid homeostasis by the bifunctional SREBF2-miR33a locus. Ancestries hidden in plain sight: methylation patterns for clonal analysis. Expression of miR-33 from an SREBP2 intron inhibits cholesterol export and fatty acid oxidation. Gerin I, Clerbaux LA, Haumont O, Lanthier N, Das AK, Burant CF, Leclercq IA, MacDougald OA, Bommer GT. J Biol Chem. 2010; 285(44):33652-61. Roles for miRNA-378/378* in adipocyte gene expression and lipogenesis. Gerin I, Bommer GT, McCoin CS, Sousa KM, Krishnan V, MacDougald OA. Am J Physiol Endocrinol Metab. 2010; 299(2):E198-206. ITF-2 is disrupted via allelic loss of chromosome 18q21, and ITF-2B expression is lost at the adenoma-carcinoma transition. Herbst A, Bommer GT, Kriegl L, Jung A, Behrens A, Csanadi E, Gerhard M, Bolz C, Riesenberg R, Zimmermann W, Dietmaier W, Wolf I, Brabletz T, Göke B, Kolligs FT.
p53-mediated activation of miRNA34 candidate tumor-suppressor genes. Bommer GT, Gerin I, Feng Y, Kaczorowski AJ, Kuick R, Love RE, Zhai Y, Giordano TJ, Qin ZS, Moore BB, MacDougald OA, Cho KR, Fearon ER.